Reicher, S. D, Haslam, S.A., & Rath, R. (2008). Making a virtue of evil: A five-step social identity model of the development of collective hate. Social and Personality Psychology Compass, 2, 1313-1344. Abstract: In the first part of this paper, we re-examine the historical and psychological case for 'the banality of evil'– the idea that people commit extreme acts of inhumanity, and more particularly genocides, in a state where they lack awareness or else control over what they are doing. Instead, we provide evidence that those who commit great wrongs knowingly choose to act as they do because they believe that what they are doing is right. In the second part of the paper, we then outline an integrative five-step social identity model that details the processes through which inhumane acts against other groups can come to be celebrated as right. The five steps are: (i) Identification, the construction of an ingroup; (ii) Exclusion, the definition of targets as external to the ingroup; (iii) Threat, the representation of these targets as endangering ingroup identity; (iv) Virtue, the championing of the ingroup as (uniquely) good; and (v) Celebration, embracing the eradication of the outgroup as necessary to the defence of virtue. 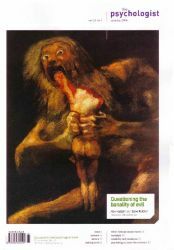 Beyond the banality of evil: Three dynamics of an interactionist social psychology of tyranny. Personality and Social Psychology Bulletin, 33, 615-622. Abstract: Carnahan and McFarland (2007) critique the situationist account of the Stanford Prison Experiment by arguing that understanding extreme action requires consideration of individual characteristics and the interaction between person and situation. We develop this argument in two ways. First, we reappraise historical and psychological evidence that supports the broader ‘banality of evil’ thesis – the idea that ordinary people commit atrocities without awareness, care or choice. Counter to this thesis we show that perpetrators act thoughtfully, creatively, and with conviction. Second, drawing from this evidence and the BBC Prison Study (Reicher & Haslam, 2006a), we make the case for an interactionist approach to tyranny which explains how people are (a) initially drawn to extreme and oppressive groups, (b) transformed by membership in those groups, and (c) able to gain influence over others and hence normalize oppression. These dynamics can make evil appear banal, but are far from banal themselves. Questioning the banality of evil. The Psychologist, 21, 16-19. Abstract: There is a widespread consensus amongst psychologists that tyranny triumphs either because ordinary people blindly follow orders or else because they blindly conform to powerful roles. However, recent historical evidence challenges these views. In particular, studies of the Nazi regime reveal that its functionaries engaged actively and creatively with their tasks. Re-examination of classic social psychological studies points to the same dynamics at work. This article summarizes these developments and lays out the case for an updated social psychology of tyranny that explains both the influence of tyrannical leaders and the active contributions of their followers. Reicher, S. D. & Haslam, S. A. (2006). On the agency of individuals and groups: Lessons from the BBC Prison Study. In T. Postmes & J. Jetten (Eds.) 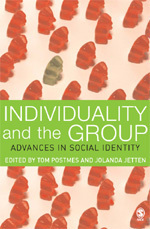 Individuality and the group: Advances in social identity (pp.237-257). London: Sage. A group that a person perceives themselves to be a member of in a particular context (i.e., a group that defines a person's social identity - "us").